This beautiful and historically comprehensive production takes an in-depth look at a railroad that operated where some say a railroad should never have been built. Crossing three of the highest snow-swept railroad mountain passes in the nation, through alpine meadows and down slot canyons, the Rio Grande Southern traversed territory better suited to mountain goats than steam trains. Famed rail photographer Otto Perry tracked the "Southern" for ten years through the peaks of the Colorado Rockies- to the gold and silver mines of Ophir, Rico, and Telluride. We see triple-heading on 4% grades, the cattle rush through the golden aspens of autumn, and we ride the fabled "Galloping Goose". This ingenious car-train combo kept passenger service alive on the "Southern" for years. This feature represents the best of Perry's unique and spectacular footage. To complement his photography, Sunday River interviewed several former employees of the railroad and their family members. Their stories, interspersed throughout the show, tell in detail how they held together "like one big family" battling gigantic snow drifts, washouts, aging equipment, and financial hardship. Against the backdrop of the mountain peaks, we see how these ordinary men and women, by their courage and the sweat of their backs, kept this railroad alive against all odds. This is one of our best! Award Value: 224 Points Earn points for free DVDs. Signup free. Union Pacific of Colorado (omaha, NE) on 2011-08-02 17:44:09. IF YOU LOVE SOUTHWESTERN COLORADO, THIS IS A MUST HAVE. Bud Hunter on 2009-10-03 08:00:34. I will give this DVD an "average" rating, especially considering the price paid for this DVD. 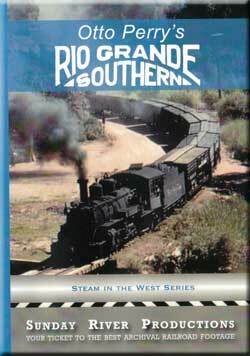 I know that video of Rio Grande Southern is not easy to come by, I was disappointed that what this DVD had were a lot of short scenes dissolving one after another almost every 5 seconds. I would have also liked to have seen maps of the locations of the video. On the PLUS side, the quality of narrations, interviews, and dubbed in locomotive sound was very well done.